Namibia, May - July 2013 - Namib-Naukluft A. Hammerstein Lodge and Sossusvlei. This a popular lodge with tour groups but the campsite is very quiet - it only has 3 sites. 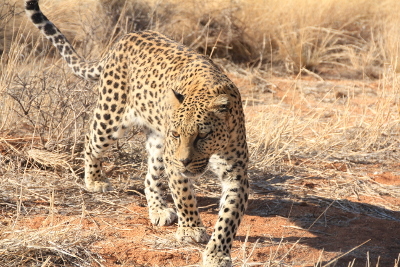 The lodge has several enclosures with cats that have been hand-reared and cannot be released into the wild and you can go on a 'wild cat walk' for N$80 per person. The tour groups tend to arrive mid afternoon, do a cat walk late afternoon and then leave early in the morning so the morning cat walk is much quieter - it was just the 2 of us! The first cat they got was a leopard and she's still there but it's considered too dangerous to enter her enclosure. Later the family took on other cats that had been hand-reared and currently they have 2 pairs of caracals and a pair of cheetah. 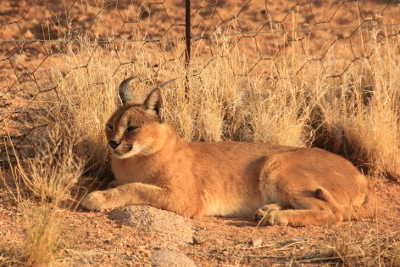 One pair of caracals have an enclosure near the lodge and we often saw one of them walking around. The other enclosures are further away so you only get to see the cats if you do the 'walk'. 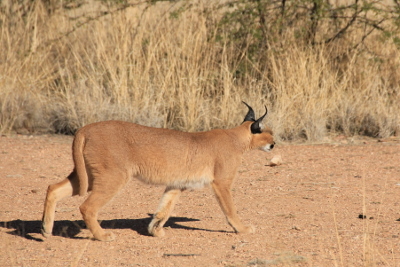 We were surprised to see how short the caracal's tail is. This is a male and was noticeably larger than the female. We saw this one every morning as it was in an enclosure next to the lodge. 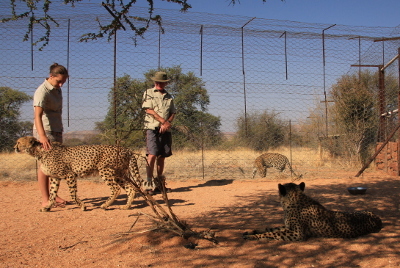 The 2 cheetah had recently been fed and were still close to the gate so we didn't have to walk far to see them. They were very tame we were able to get very close to them. Kevin and our guide with the cheetahs. The leopard is in the next enclosure. 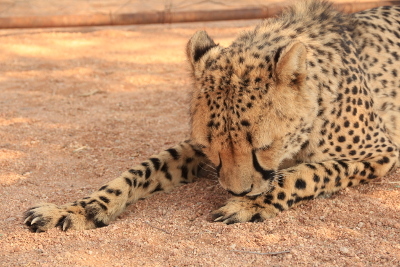 Cheetah are the only cats that do not have retractable claw. Last time we were here we visited Sossusvlei late afternoon so this time decided to go in the early morning. 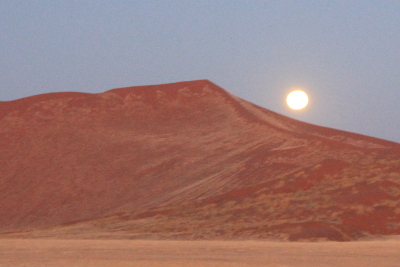 We stayed at Sesriem Rest Camp as you can enter the Park an hour before sunrise - it's 60km from Sesriem to Sossusvlei. 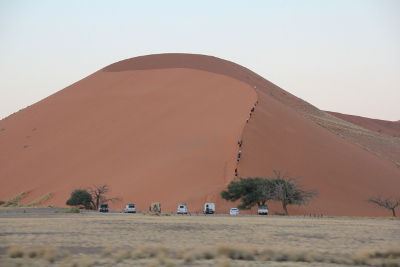 Driving to Sossusvlei we passed Dune 45 and saw several people walking up the dune to watch the sun rise. The full moon just about to disappear behind a dune. The early morning light creates wonderful shadows on the beautiful red dunes. We walked up one of the smaller dunes at Sossusvlei (which we had to ourselves) and had a great view of the surrounding landscape. 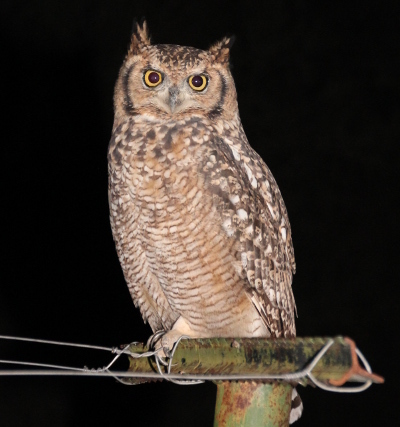 A pair of giant eagle-owls were in the tree at our campsite at Sesriem. One of them flew down and stood on the nearby washing line post for a long time and allowed us to get quite close.